The Declaration of the Rights of the Child is first adopted by the United Nations. In 1924, the League of Nations adopted the Geneva Declaration, a historic document that recognised and affirmed for the first time the existence of rights specific to children and the responsibility of adults towards children. On 20 November 1959, the Declaration of the Rights of the Child was adopted unanimously by all 78 Member States of the United Nations General Assembly in Resolution 1386. The Cuban Missile Crisis ends. Officials disclosed that the U.S. would insist on a time line in the UN negotiations on pullout details. Informed sources said it should be a “very, very short” period, a matter of days, because some of the missiles already are operational. In a new letter to the Kremlin leader the President declared that he now believed he and Khrushchev had reached “firm” agreement on the terms for ending an ominous East-West clash that had carried the world to the brink of nuclear war. In return for a speedy missile pullback in Cuba, under UN supervision, the President said the U.S. would lift the sea blockade and offer Russia assurances against a Cuban invasion. In a separate gesture to smooth the path to a final settlement the President voiced “regret” that an American plane collecting fallout samples in the atmosphere had slipped into Soviet air space in far northeast Siberia. He promised that “every precaution” would be taken to prevent a recurrence. 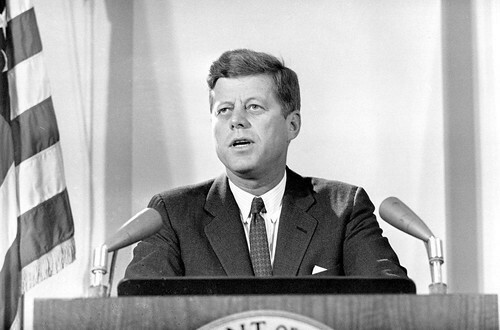 Kennedy’s letter was made public less than eight hours after the Moscow radio broadcast a Khrushchev letter agreeing to Kennedy’s missile pullout demands. It seemed to mark the beginning of the end of the fateful cold war collision. Around the world the news brought a sigh of relief despite Administration attempts to ward off any premature victory statements. Even Kennedy suggested in his letter that a solution was at hand. Underlining this was the fact that Kennedy spent the first afternoon away from his desk since the crisis erupted. On November 20, 1985, a small technology company out of Bellevue, Washington launched a 16-bit graphical operating system for the PC. Originally called Windows Premiere Edition.1, it soon became the foundation for the world’s most prevalent operating system and for one of the most dominant technology companies in history. Windows 1.0 is a graphical personal computer operating environment developed by Microsoft. Microsoft had worked with Apple Computer to develop applications for Apple’s January 1984 original Macintosh, the first mass-produced personal computer with a graphical user interface that enabled users to see user friendly icons on screen. Windows 1.0 was an important milestone for Microsoft, as it introduced the Microsoft Windows line, and in computer history in general. Windows 1.0 was declared obsolete and Microsoft stopped providing support and updates for the system on December 31, 2001. Trials against 24 Nazi war criminals begin at the Palace of Justice in Nuremberg. Activists from native American tribes seize control of Alcatraz Island. Native American activists seize control of Alcatraz Island until getting removed by the US Government on June 11, 1971. Stalinist and anti-Semitic show trials take place in Czechoslovakia. Fire breaks out in Windsor Castle, which badly damages the castle and causing over £50 million worth of damage.